Shop online and enjoy up to 50% off select Baby Jogger items. Click link to shop. Check out the great selection of accessories from Baby Jogger and enjoy a 20% discount on select items. 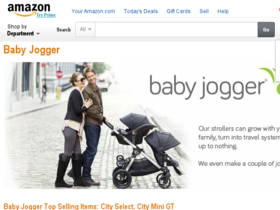 Shop online and take advantage of free shipping on select items from Baby Jogger. Act now and get your Baby Jogger stroller from as low as $240.